Mixed rice scores more than anything else in my lunch menu chart. Lots of kids would say "same pinch" to me right now ;) And for sure its an easy packing menu for parents too. 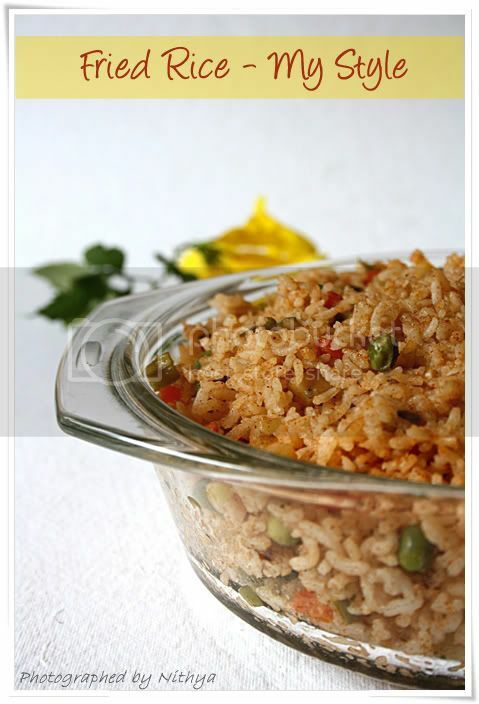 Cook rice and allow it to cool on a plate. Add few drops of ghee or olive oil to it and separate it into grains. Keep this aside. Grind ginger and garlic together into a paste. In a pan take 2 tsp of olive oil and add the ginger garlic paste as well as chopped vegetables. Saute well for few minutes and add 1/4 cup of water and cook the vegetables till tender. Once done add the rice, salt, paprika, gharam masala and chilly powder to it and saute till everything blends well. Your version looks so simple and delectable ! Jokes apart, fried rice looks just awesome!!! Simple , Healthy & Colorful !! Lovely fried rice dear..And awesome presentation. 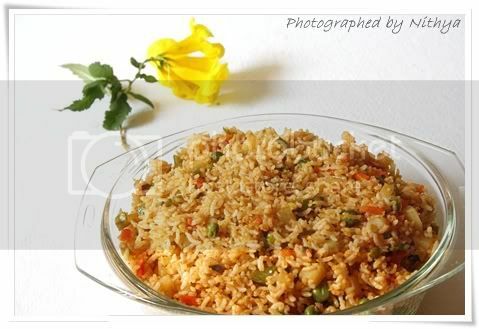 Droolworthy fried rice, lovely dish..
Fried rice looks lovely dear!!!! Tasty rice and lovely click!! Love this Indianized version,love it Nits :) ! this looks perfect, so spicy and yumm Nithya! Do participate in my on going event Green Gourmet Nithya! Lots of paprika usage of late haan ? I love it in anything and everything I make. Lovely presentation..simple and healthy rice. Indo version fried rice. Look at the color it's so tempting. Awesome Nithya. 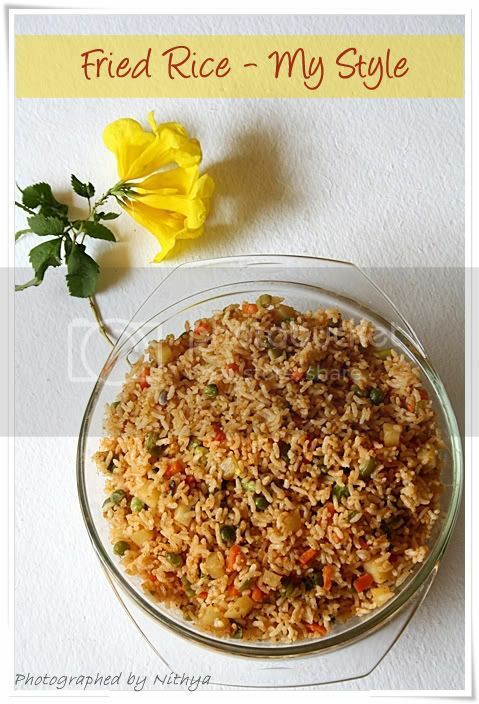 Any type of fried rice Indianized or chinese whatever..I am in ..looks yummy nithi. Looks very nice.will try ur way sometime..
Fried rice in indianised version sounds yum...luved the glass bowl! Nithya, a very Indianized version of fried rice. It looks yum :). Quick one for a hearty meal!Lovely, Nits:)I love those yellow flowers..We used to have in my grandma's house and we used to pop them..
wooo looks soo tempting dear..was looking at ur remaining recipes specially ur chocolate cake looks soo good..
Ur fried rice looks really good Nitya. Nice presentation too. First your fried rice is gorgeous by itself. And then you suggest to eat this with potato chips. Can it get any better? No. Never. Ever. 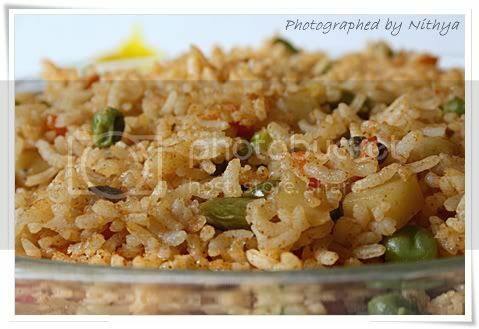 Your version of this fried rice is really simple n deserves a try nits.Lovely pics.Color is different too n pleasing. 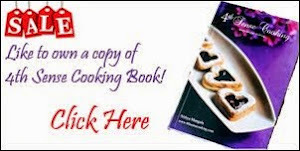 such an easy and simple recipe! !